Feeling for a pulse in a patient suffering cardiac arrest is one of the more misunderstood actions associated with advanced life support. This review aims to break down the process of pulse checking to give a better understanding of this important task. Why: We feel for a pulse in unconscious or critically unwell patients to assess perfusion and quickly quantify cardiac output. When a patient loses their pulse we can assume that their cardiac output has dropped below the level required to perfuse the brain and other vital organs. The absence of a palpable pulse is a primary sign of cardiac arrest and should be treated aggressively. Where: Pulses can be palpated at numerous sites around the body. Peripheral pulses like the radial may be anatomically easier to locate in a well patient, however they will often not be detectable at lower blood pressures. For this reason central pulses are more useful in the setting of cardiac arrest where time is of the essence. The two most common sites to aim for are the carotid and femoral pulses (While the carotid is typically easier to find, the femoral is often more accessible in an arrested patient). Historically different figures have been suggested to link the presence of different pulses to specific systolic blood pressures (i.e. Radial pulse = systolic >80, Femoral pulse = systolic 70-80 etc. ); However, there is little evidence to support any reliable correlation between different pulses and specific blood pressures (Rebel EM have a good review on this topic @ http://rebelem.com/atls-wrong-palpable-blood-pressure-estimates/). 2-3 fingers are placed over an artery. Pressure is applied until a pulsation can be felt under the tips of the clinician’s fingers. This pulsation indicates that blood is flowing through the underlying artery, which in turn indicates that the heart is pumping. The thumb should not be used when feeling for a pulse as the ‘feeler’ of the pulse is likely to detect the pulsation of their own radial artery being transmitted through the thumb. In an unconscious or shocked patient, even central pulses may be difficult to feel. If you are relying on the presence of a pulse to rule out cardiac arrest and you are unable to CONFIDENTLY determine that the pulse is there, treat the patient as arrested (they will respond accordingly if they are alive and you start pressing on their chest – if they don’t respond, then carry on pressing)! One interesting study found that doctors and nurses were only able to correctly identify the presence or absence of a pulse 78% of the time. The same group was noted to incorrectly identify the presence of a pulse 14% of the time (Feeling a pulse that was not really there); potentially delaying vital treatment in an arrested patient (Tidballs & Russell, 2009). This study helps to confirm that even as health professionals, it isn’t always easy feeling the pulse of a sick patient. When feeling pulses in the context of cardiac arrest or critical illness, it’s also helpful to confirm that the pulse you are feeling matches the electrical rhythm on the cardiac monitor. If the monitor reads 15 beats per minute and you feel a pulse of 120 bpm, you are probably feeling your own pulse. The take-home message is that you can have a rhythm without a pulse, but not a pulse without a rhythm! How long: In the patient where cardiac arrest is suspected (unconscious, not breathing etc.) 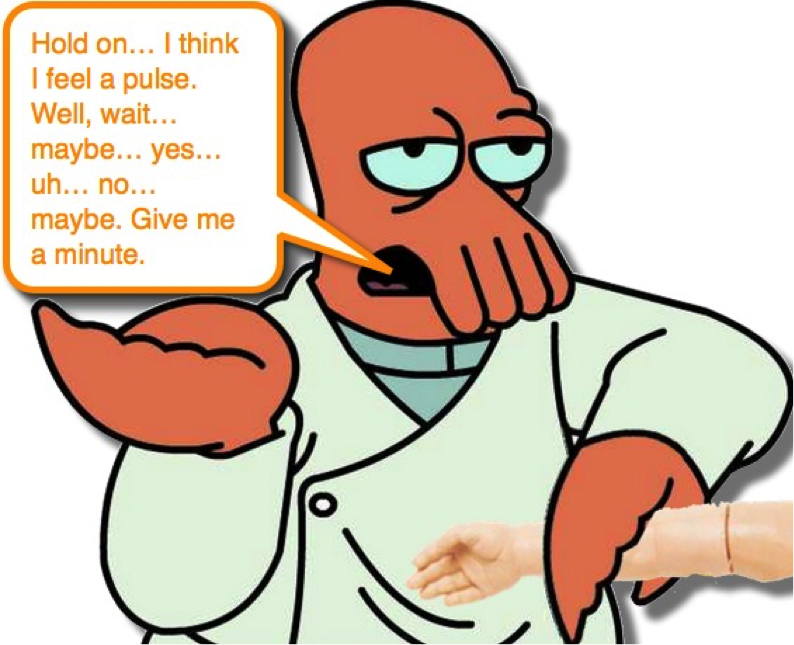 a healthcare professional should not spend longer than 10 seconds attempting to feel for a pulse. If after 10 seconds a pulse cannot be felt, it isn’t there – start CPR. When: Assessment of central pulses can provide vital information very quickly for any acutely unwell patient. In the context of cardiac arrest – the absence of a palpable pulse is how we traditionally differentiate cardiac arrest from other causes of unconsciousness. Whenever you are worried about a patient, a finger on the pulse goes a long way. There is a common practice of holding onto the femoral pulse of an arrested patient to determine the quality of the chest compressions being provided (the theory being that the pulse represents the blood flowing through the femoral artery resulting from the external compression of the heart). There is mixed evidence on this practice with some studies suggesting that the pulsation felt during compressions comes from the femoral vein rather than the femoral artery. My feeling is that there isn’t much merit in this practice as there are better ways to monitor the ongoing quality of chest compressions i.e. ETCO2, Arterial lines (if available) & good old fashioned visual monitoring of compression rate and depth. Following each rhythm check there MAY be an indication for a pulse check. It is important to understand that the pauses in the ALS algorithm are NOT for pulse checks; they are for RHYTHM checks! If VF or VT is identified during a rhythm check – the patient gets a shock and you’re back onto the chest. If any organised electrical rhythm is identified during the rhythm check, the defib can be disarmed and you perform a pulse check to determine if you have ROSC or PEA. This point becomes important when utilising a guided defibrillation tool like the COACHED pneumonic. The purpose of such a tool is to maximise the compression fraction by ensuring the amount of time spent off the chest for each rhythm check is kept to the bare minimum. When following COACHED effectively, there is a good chance a patient with a shockable rhythm will receive their shock within 5 seconds of compressions stopping. If the process is modified by having someone continually holding onto the pulse during the rhythm check there is an increased risk of delays to defibrillation or worse – pulse checkers getting a wee zap. With coordination, the practice of holding a pulse into a rhythm check can work; however this requires the pulse checker to keep an eye on the rhythm and release the pulse if they see VF or VT on the defib. With good clear communication between the pulse checker and the defib operator this process can introduce a benefit by having an extra set of eyes (the pulse checker) to corroborate rhythms and more importantly, having the ability to differentiate PEA from ROSC more efficiently so that PEA may be treated with further high quality CPR. In an already high functioning team this concept may be useful, but for most novice to intermediate teams I feel that a structured approach to safe defibrillation provided by COACHED (or alike) may improve important measures like compression fraction and time to defibrillation while ensuring everyone stays safe. If you think you might have trouble finding the pulse again after the rhythm check, it can be helpful to mark the pulse site quickly with a marker/pen i.e. a circle or a cross over the femoral pulse can make it much easier to find when you come back to check for a pulse in your organised rhythms. Extra: There are a number of different adjuncts that may support the process of pulse assessment in cardiac arrest. End tidal carbon dioxide (ETCO2): May be more useful than pulse palpation for assessing the quality of chest compressions and predicting ROSC (ETCO2 decreases as compression quality falls & may suddenly increase when ROSC is achieved). Arterial lines: May also be used to continually monitor the quality of chest compressions during CPR and to identify ROSC. (These are useful if they are already in situ when the arrest occurs, they can be challenging to site and their intra-arrest placement should never interrupt chest compressions). Feel central pulses (femoral – carotid). Don’t take longer than 10 seconds. If in doubt – start compressions. Pauses in compressions are primarily for RHYTHM CHECKS not pulse checks. You can have a rhythm without a pulse – you cannot have a pulse without a rhythm. Consider adjuncts like ETCO2 and art lines to monitor CPR quality and the likelihood of ROSC. Focus on high quality compressions with a high compression fraction. Plan your interventions and interruptions for rhythm checks (use this time wisely). Use adjuncts to predict ROSC at the next rhythm check – Don’t stop compressions early unless the patient stops you.